Fleetwood Town head coach Uwe Rosler says David Ball is staying put in the transfer window after reaching double figures for the first time since the 2013/14 season. Ball reached the 10-goal mark with a sublime solo finish to seal Town’s 3-1 win over Bristol Rovers on Saturday. The in-form hitman is out of contract in the summer and Rosler revealed the 27-year-old has turned down a new deal. 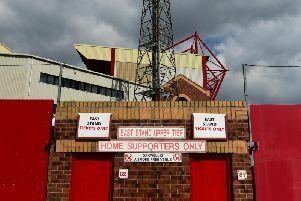 But Rosler hopes the team and club can show Ball, who swapped Peterborough for the Fylde coast in 2012, that Highbury is his place to be as they prepare to host Championship side Bristol City in a third round FA Cup home replay tomorrow night. “I think he is enjoying his football,” Rosler said of Ball. “He is a very smart player, we can play any formation with him. “He is very knowledgeable; I think he brings technical and physical aspects into our game. “He has a great endurance level, he runs and runs and does a job with and without the ball. “He is a great finisher and I’m really delighted to have him. “Our chairman (Andy Pilley) made a very good offer to him but David Ball turned it down, which is his right. “It is no problem, it is early days and the player will not leave in that window that is for sure. And, while trying to tie up players to new deals, Rosler says the club is also working to bring in some midfielders to shoulder the burden on Kyle Dempsey, Bobby Grant and George Glendon. His side made it 13 games unbeaten with Saturday’s win over Rovers but the squad was hit by injury again after captain Nathan Pond came off in the 58th minute due to a suspected knee injury. Rosler said: “We are trying really hard (to bring people in). “The chairman is fantastic, Gretar Steinsson (technical director) and Steve Davis (chief scout) are working really hard; they try to help me, to help the team, to help our football club. “Obviously we have a certain budget available and we are going for players, especially in midfield who can make us immediately better and really challenge. “It is tough as we are competing with a lot of other clubs in a different region of budget.